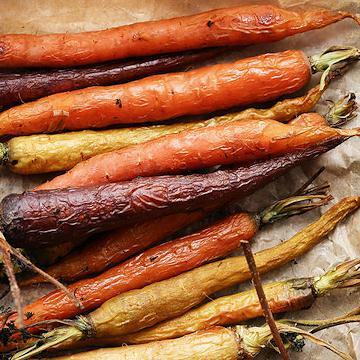 Rainbow Carrots are not only flavorful and rich with nourishing vitamins and nutrients, but they're ready to serve alongside your favorite entrees after just minutes in the oven - without an ounce of prep work. You may recognize the eye-catching colors of our Glazed Rainbow Carrots from the produce section of upscale grocery stores or your local farmer's market. Their popularity has soared in recent years, particularly because they're an easy way to add both the visual flair and vibrant flavor to any meal. Our take on this modern side dish does that for you - but with our Glazed Rainbow Carrots, you get the benefits - without any of the hassle - delivered directly to your door. KEEP FROZEN: COOK THOROUGHLY: Appliances vary, adjust cook time accordingly. FOR FOOD SAFETY AND QUALITY, FOLLOW THESE COOKING INSTRUCTIONS. FOOD MUST BE COOKED TO AN INTERNAL TEMPERATURE OF 165�F AS INDICATED BY A FOOD THERMOMETER. DO NOT MICROWAVE! OVEN: Preheat oven to 400�F. Remove plastic wrap from tray and discard. Place tray on a foil lined baking sheet. Place baking sheet on the center rack of the oven. Bake for 40-50 minutes or until product reaches 165�F. Ingredients: Multicolored Carrots, Water, Unsalted Butter (Cream, Natural Flavor), Honey, Canola Oil, White Wine Vinegar [Diluted With Water To 10% Acidity], Salt, Corn Starch, Thyme, Black Pepper.